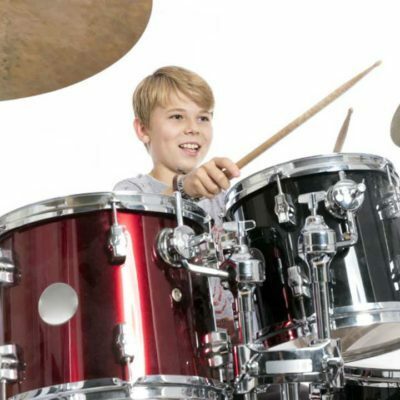 With the convenience with the introduction of electric drum sets, your child can have the option to play and practice to his/her heart’s content. 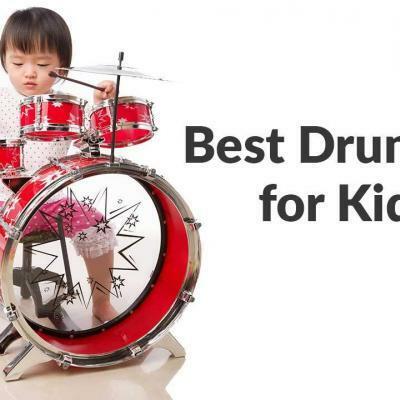 An awesome gift for your child to hone skills, especially when musically inclined, is a set of drums. 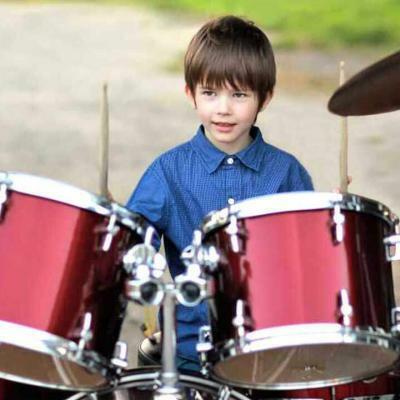 You can just imagine the enthusiasm when the child starts beating that drum set. As a parent, you couldn’t be prouder. But not the same is true your neighbors, visiting friends or even the other members of your own family. 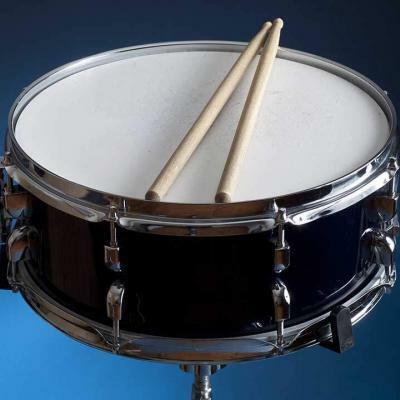 Nothing can be more annoying than non-rhythmic drum noise made by a learning child. What more when the child gets the urge to play at night. Even while practicing, you won’t be getting complaints from the neighbors. Earphones make this all possible. That’s because the sounds from the various electric drum sets be electronically carried to earphones. 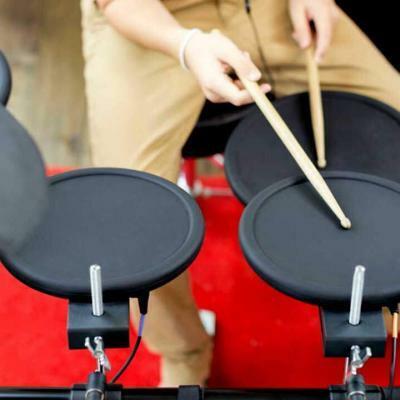 Electronic drum sets isolate the sounds, but they also have other great features. These features make it more worthwhile to purchase. Several brands are out there in the market. Before you decide which brand to purchase, read through all the features. Although the function remains the same, find the features which are best for your child. This electric drum set is ideal for beginners. With this, your child can have learning sessions without disturbing the peace. It has high-quality built-in speakers. It also has a variety of acoustic drums. The earphone jack will allow your child to practice quietly. You can connect the Rockpals drum set to a computer so it can play any drum game. 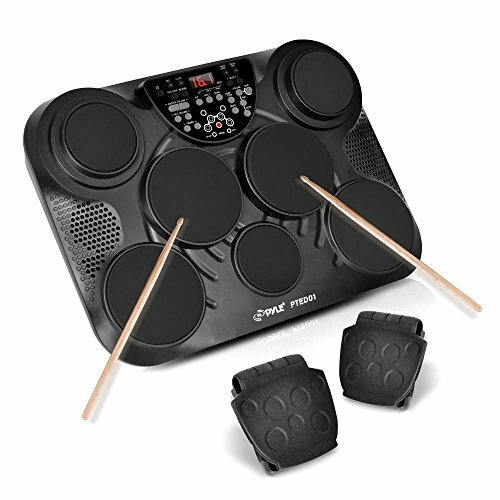 A rechargeable battery powers the drum set and it offers up to ten hours of continuous play. It’s a portable drum set with professional features. 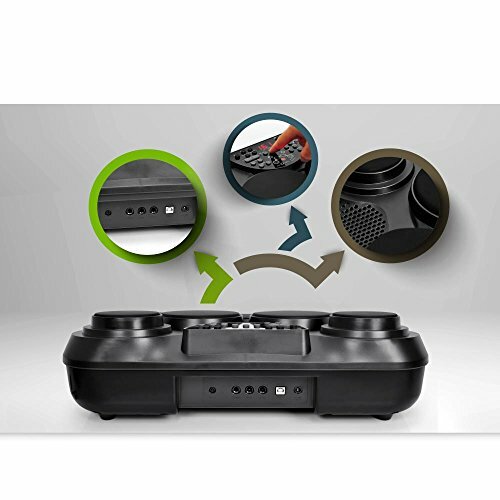 The battery is rechargeable and can operate for up to 10 hours when fully charged. Comes with a jack for the earphones and a speaker that’s built-in. Sounds might come out distorted at times. Some customers have complained about the battery life. The Pyle-Pro PTED01 kit is an amazing electric drum kit. 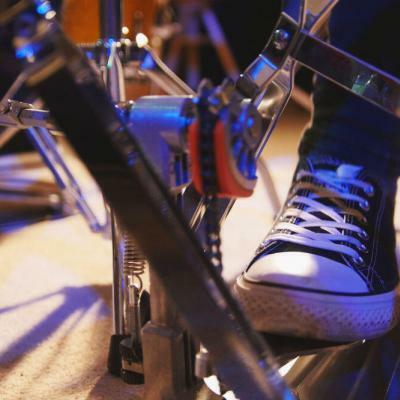 The features allow it to copy the sounds of a real drum set, without the unwanted bulk. It’s lightweight in construction, making it portable but loaded with great techno features. 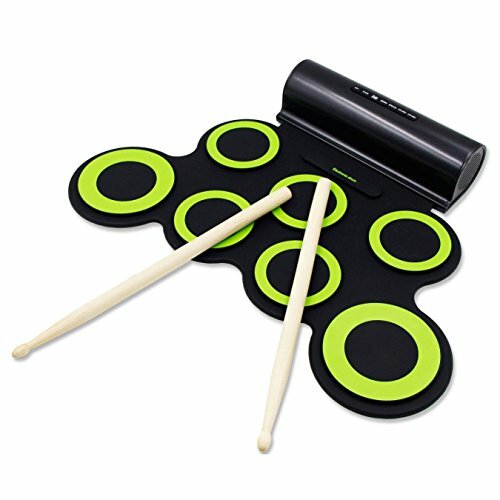 The whole set comes with 7 Drum Pads. These have a unique Touch Sensitivity. It has Pedals Pad for controlling the bass and up to 100 songs. All the features will allow you to play drums on pre-recorded songs. You can even record songs of your own. The controls for audio configuration allow you to create unique, customized music. It’s portable and wireless so you can bring it wherever you go. 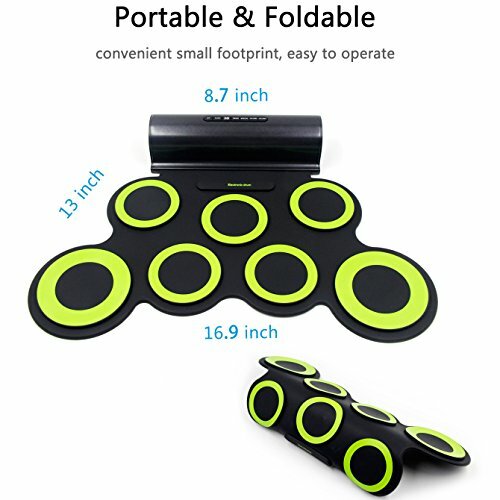 Comes with a USB cable for you to connect to the computer and other devices. Sometimes hits do not register. Occasional slow response of the pads. The Alesis CompactKit 4 electric drum set is ideal for beginners but it’s still loaded with special features. This is unique because it includes built-in learning tools. In coach-mode, the unit will teach you basic styles and patterns for drums. 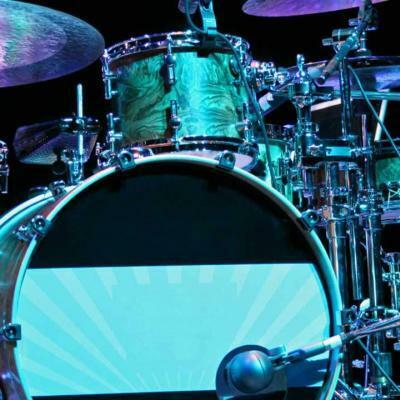 Even without any previous training, the visual indicator on the set’s LED screen makes it achievable to teach you on basic drum skills. This kit has 4 pads which are velocity-sensitive, providing realistic sound. It has percussion voices, effect voices, and songs to play-along. The level of difficulty in is adjustable. It’s a lightweight drum kit can be set-up and carried around easily. You can plug this in or use it with batteries. Doesn’t come with a minimum volume option. The plastic material doesn’t seem very durable. Let’s compare the three electric drum systems, highlighting each one’s uniqueness. The Rockpals Roll Up Drum Practice Pad Midi Drum Kit is portable and can be easily set up for playing. You can connect it to your PC to play games. But, if you intend to use this model to record music that you produce, then look for another electric drum set. That’s because this one has no support for this function. The Pyle-Pro PTED01 Electronic Table Digital Drum Kit is for those who already have some sufficient knowledge on playing drums. Of the three, it offers the most advanced features. It has recording functions, where you can achieve editing and processing of music on the spot. It also can encourage creativity as the kit allows the user to build his/her own library of styles. 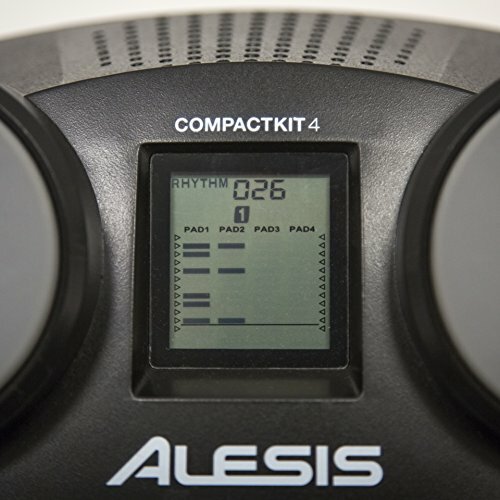 The Alesis CompactKit 4 has two unique features that make it a class all on its own. First, it has a built-in game feature. This brings an added measure of fun to the experience of learning how to play. Second, it has a coach-mode feature which displays notes on the LCD monitor. This teaches the user how to play along with the built-in sounds and songs. The Rockpals Roll Up Drum Kit is the most recommended for beginners. Its ease of setting up and size is best fitted for young kids. And as an extra bonus, you can attach this drum kit to a PC. This will allow the kids to play drum games. It is a great buy for true beginners. 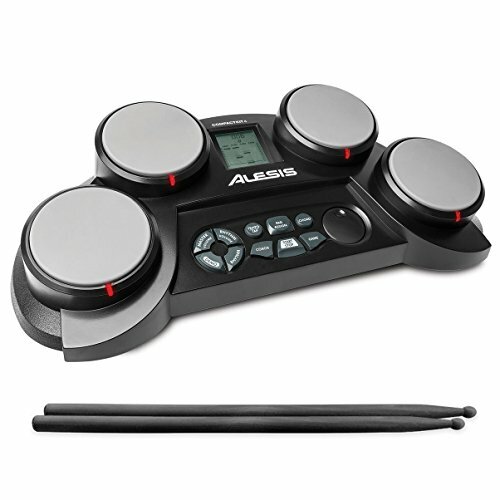 The Alesis CompactKit 4 has unique features that make it a class all on its own. The Coach-mode perhaps is the most outstanding feature of this model. This mode displays the notes played on the kit’s LED monitor. It teaches the user how to play along with the built-in sounds and songs. It also is a great buy, perhaps for kids higher up. The Pyle-Pro PTED01 Digital Drum Kit is for more skilled drummers. That’s because it will take experience to operate this model. 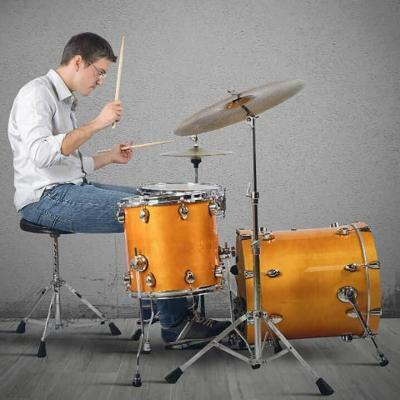 The performance of the drum set is high in efficiency and quality. The feature which allows the user to record, edit and process music is for pros. These are some of the best electronic drum sets for beginners. Now all you have to do is choose the right one for your child.